That place is beautiful Janette and and the bluebonnets are perfect! It is next to a cemetary and I have decided I want to be buried there. Cool~! Where is it?? Are we still on for tomorrow? PERFECT! I even like the picture with Cora crying in it...not b/c I like to see babies cry--but it is so perfect and I love to see real emotion in pic's and not always smiling....am i weird? U have to tell us where it is??? Is it close? In Mid April, take 380 to 423, and turn left. About a mile down the road, on your left, is a cemetary set on a steep hill. The hill is coated in them. And, because it is a hill, it makes it so that the whole background is nothing but bluebonnets. We took our pictures there 2 years ago. Prettiest pictures. I swear. We never would have found that place if Gary hadn't worked in the subdivisions right by it. It's gorgeous! 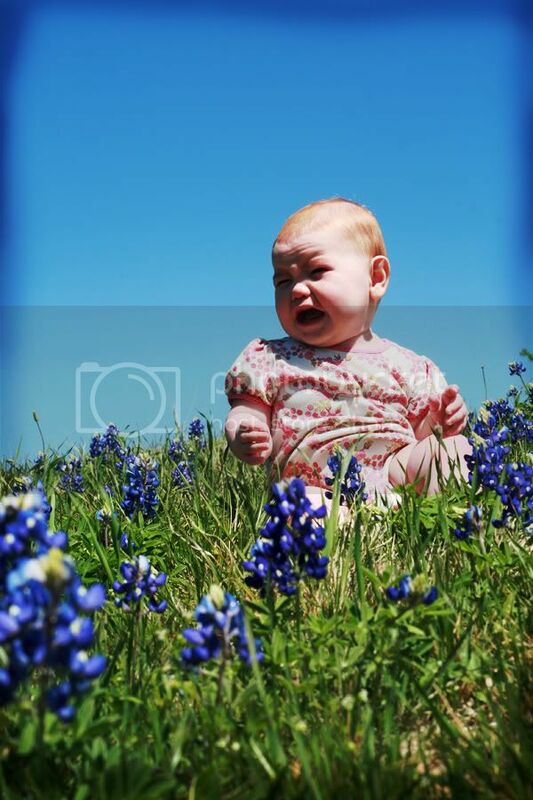 Y'all, don't trample the bluebonnets before I can get there!! And I want to see more pictures!